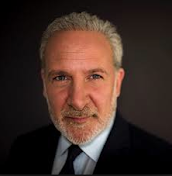 Peter Schiff On The Markets: U.S. Economy: Is The Weak Data A Prelude To An Actual Contraction? U.S. Economy: Is The Weak Data A Prelude To An Actual Contraction? All of the coverage that I am hearing on the news about the economic numbers coming in weak is all, "the glass is half full." People are saying, "oh, well, the numbers are lower than we expected but the economy is still growing. Yes, it is growing a bit more slowly than we thought but it is still growing." Well, if we are going to go from growth to contraction, we have to slow down first. Yet everybody is assuming that these trends that are now entrenched are not going to continue. If you see a sharp decelaration in growth, how do you think it is not a prelude to an actual contraction?